A four-minute video posted on Twitter of Democratic Texas Senate candidate Beto O'Rourke answering a question about his stance on protests over NFL players taking a knee has gone viral. 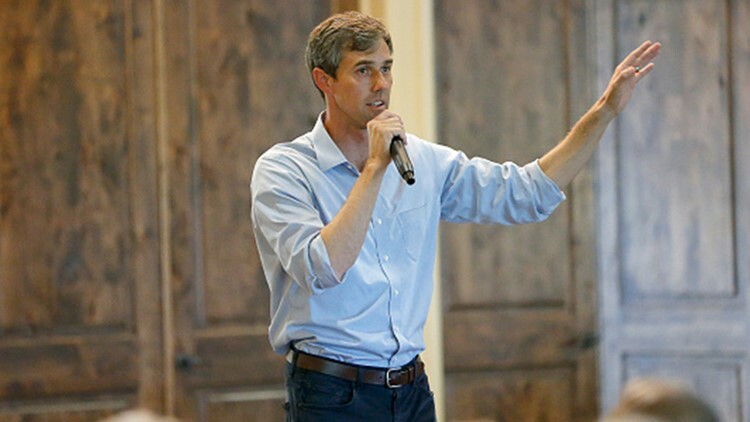 O'Rourke's comments about protesting racial injustice during the national anthem has grabbed the attention of Lebron James, Kurt Warner, Ellen DeGeneres and so many more. The video was posted by NowThis News and credits Nivien Saleh for the footage. The El Paso Democrat who is challenging incumbent Sen. Ted Cruz in November goes through his explanation of why he supports the protests and compares the sacrifices of soldiers, civil rights activists and veterans. "My short answer is no, I don't think it's disrespectful," he said. The video was posted Tuesday Aug. 21 and so many online have taken notice since. "I can think of nothing more American than to peacefully stand up or take a knee for your rights for your rights, anytime anywhere any place," O'Rourke said. "Most Texans stand for the flag, but Hollywood liberals are so excited that Beto is siding with NFL players protesting the national anthem that Kevin Bacon just retweeted it. That means all of us us can now win Six Degrees of Kevin Bacon!" The video has almost 15 million views as of Friday morning after being seen by so many others including Ellen DeGeneres. She tweeted that after seeing this video she wanted to meet him.